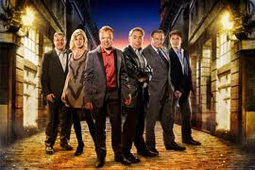 Having solved a problem like Maria and reunited Joseph with the amazing technicolour dreamcoat, John once again took his seat on the judging panel alongside Denise van Outen, Barry Humphries and Andrew Lloyd Webber to help find a star for Cameron Mackintosh's new production of Oliver!, which was due to premiere in January 2009. The twelve fantastic finalists were eventually reduced to three, with Jodie Prenger taking the role after the final public vote, ahead of Jessie Buckley and Samantha Barks. After starring as Nancy in Oliver!, Jodie Prenger went on to join John as his special guest on his 2010 concert tour.